Heart's Delight Cards: FRIDAY FUNDAY CHALLENGE! For our first challenge of the year, I decided to keep it simple, so no sketch or color requirements this time. The theme is FRIENDSHIP. Go wherever your heart takes you with this one! The challenge will run until next Friday, Feb. 5th, when I will post a new challenge. Upload your link using Mr. Linky below. I can't wait to see what you've made! Edited to add: I don't know why Mr. Linky isn't showing the links, but people ARE participating. You have to click on the widget to be able to see the links to the lovely creations. 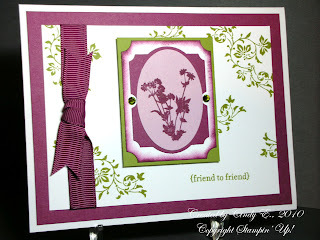 Beautiful card...great challenge! I'll try to get one done this week!